Sheet mask enthusiasts rejoice! 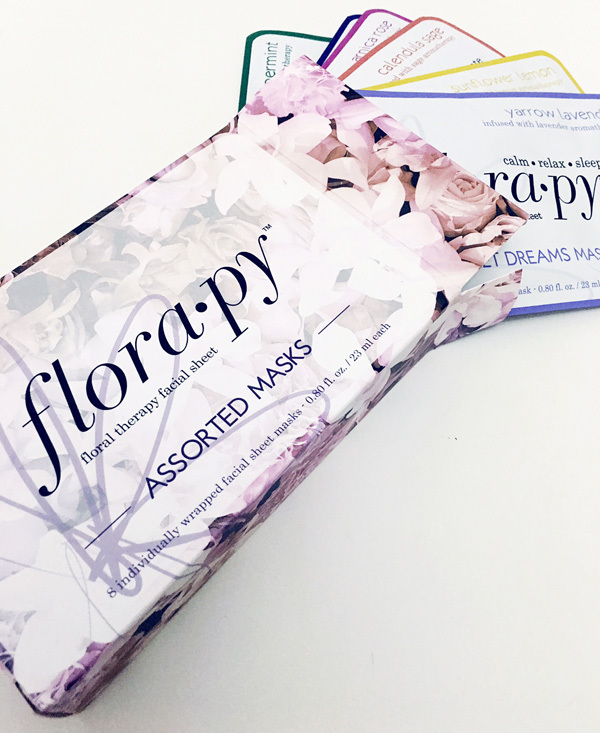 Inspired by the healing powers that blossom in nature, Flora•py‘s therapeutic skincare collection has a very special sheet mask delivery system. They have packed their masks with floral ingredients proven to aid in skin health, along with essential oils proven throughout history to enhance mood and improve mind/body balance. Unlike many other sheet masks out there, Flora•py boasts no animal testing, their vegan friendly, paraben-free, and have no synthetic fragrance, harsh dyes or pigments. The 100% coconut sheet masks are soaked in highly nutritious flower ingredients and powerful aromatherapy essential oils. Each product has been carefully crafted to create the perfect balance of ingredients to harmonize the skin, mind and body. The coconut material delivery system holds 20x its own weight in water and adheres gently to the surface of the skin to ensure all the benefits infused in the mask can transfer and absorb into the skin. Using Flora•py not only provides ultra hydration to the skin, but also provides a much-needed time out. During the 15-20 minute mask treatment, you’ll experience the cooling sensation of the floral therapy facial sheet and you’ll breathe in the benefits of aromatherapy.